Phizz-whizzing new branding for the world's No.1 storyteller, Roald Dahl! Exciting, bold and instantly recognisable with Quentin Blake's inimitable artwork. The hugely popular story of James and his journey to New York with the strangest group of insect friends. 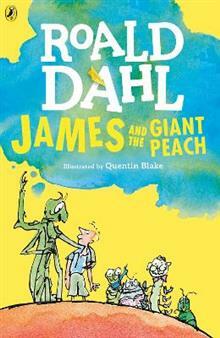 A true genius...Roald Dahl is my hero (David Walliams). Now you can listen to James and the Giant Peach and other Roald Dahl Audio books read by some very famous voices, including Kate Winslet, David Walliams and Steven Fry - and there are added squelchy sound effects from Pine wood Studios! Also look out for new Roald Dahl apps in the App store and Google Play- including the disgusting Twit or Miss! and House of Twits inspired by the revolting Twits. This newly-illustrated edition of an avowed children's favorite has all the makings of a classic match-up: Milne had Shepard, Carroll had Tenniel, and now Dahl has Smith...author and illustrator were made for each other, and it's of little consequence that it took almost 35 years for them to meet -- Kirkus.